The Carbeth Cardigan is designed to be a cropped sweater but cropped means different things to different people. Some people like a really short-waisted look but maybe it's not for everyone, or maybe you are taller than average, or maybe you just don't like to highlight a certain part of your frame. Whatever the reason for adding length to a sweater is ok! I fall into the "taller than average" category. At nearly 5'11" I have a long waist and generally buy clothes marked as TALL. I would like to add length to my Carbeth Cardigan not to avoid the cropped look but because I am a giant. I love how this sweater sweeps the model's waistband and I think I'd wear that look a lot. For the size sweater I'm knitting the pattern says to work until body measures 8" which I did. But when I held it up to my body it came just under my rib cage and felt too short to be comfortable. I have a cropped jacked that I like so I pulled that out and had a measure. Measure another item that you love to wear to help figure out how long to make your sweater. This jacket sits just above my waistline and that's about where I want the Carbeth Cardigan to be. From the underarm to the hem it is about 10.5". I think the Carbeth Cardigan is boxier than this jacket so it will look cute a little shorter because it's a bit wider. I decided to split the difference and work my Carbeth Cardigan to 9.5". Adding length to your sweater can only be done now. Once we knit the sleeves and work the yoke of the sweater we are working up toward the neckline. If you feel like you want it a bit longer give it a try! You can knit a bit more length and if you don't like it then rip back to the suggested length. If you are knitting the sweater with Baa Baa Bulky yarn it will not grow in length as you wear this sweater. Our yarns are made with a bouncy twist that really holds its shape. Choose your length now since it's going to stay that way. Adding length will use more yarn than the pattern specifications call for. There is a slight amount of overage with each size but if you add a bit more height than you very well may need an extra skein of yarn. 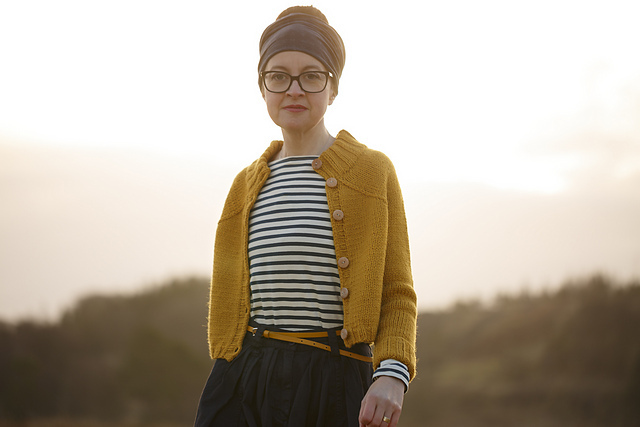 Kate Davies wrote a great article on her website about how to figure out the amount of yarn you'll need when adding length to a Carbeth (She shows the pullover but the principles are the same for the cardigan or any sweater).